Location:Unknown, Just on Landfall 7's Pelican heading for Jacks Place. Man, will Bob ever shut up. Halo 2 Remapped AI Revision will take your Halo 2 multiplayer experience to new heights. This map-pack was designed to maximize your Halo 2 multiplayer experience to its peak. AI Revision is compiled with 17 of the latest and most advanced mods ever made. 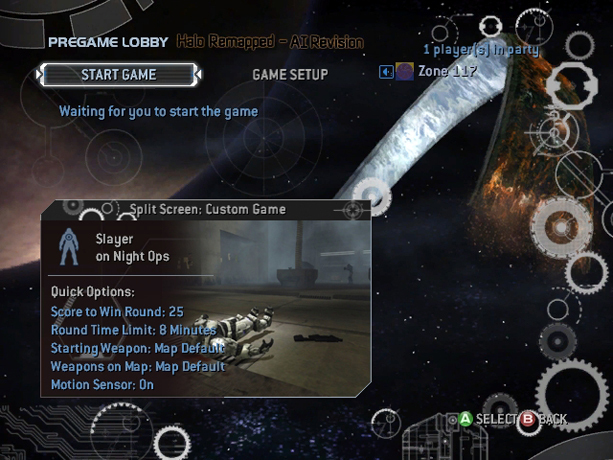 These maps were created using up-to-date modding techniques known at this time; single player campaign maps in multiplayer, AI has been integrated into every map in the pack. Enjoy playing capture the flag, team slayer, and territories on familiar campaign levels, along side with AI bots to challenge you. Detox - Created the auto-patcher, mainmenu suggestions. Xbox7887 and Kornman00 - The wonderful tool Yelo, disables auto-update and enables AI. Iron Forge - Serenity, used for the released patches. ExileLord - Created the video, and mainmenu suggestions. Trulife - Created the DVD Cover and disc label, and mainmenu suggestions. T Beezie - Created 6 of the best mods mods in this mappack. SnakeJKnight - Created 3 of the best mods mods in this mappack. Trulife, Neodos, Xiion, XxMoNkEy42xX, Headshots 1125 - DVD Case Covers and/or DVD Disc Labels. Thanks guys! REMEMBER: You MUST launch this mappack with Yelo from the Xored Trainer Launcher for AI to function. Edited by iBotPeaches, 09 May 2014 - 06:29 AM. Hey can you post a new or updated link to the xored and yelo installer to boot from cd, because the current one doesn't work. plz and thx. Xored is illegal to distribute since It has .SDK files in it. You can find those in xbins. How do you put AI bots on the multi player levels? I don't think you can get the AI to ever count towards your kills. They are spawned like via the char tag or something, so they are never really elements/players of the game. Just movable objects that have been coded for AI. Edited by johnscrub, 04 May 2010 - 07:55 AM. I don't think the Yelo Trainer is available on the 360. However, game trainers development did just start on the 360 so maybe in the distant future we will have it.